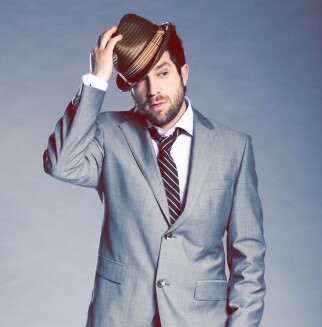 Click here to read our interview with Elliott Yamin! Getting a running start on season 5 of American Idol, ELLIOTT YAMIN has officially taken off. Though he was eliminated from the top three contestants, Best known for his first hit single “Wait For You”, Yamin has gone on to release two records on Hickory Records as well as two holiday albums. His first self-titled release came out in March of 2007, and debuted at #3 on the Billboard 200 chart. The album was the highest new artist debut on an independent label in SoundScan history. The album was certified gold in October 2007. Yamin’s second release, Fight for Love was released in May of 2009. The record was a more contemporary R&B pop than his debut, and he co-wrote the majority of the songs featured. Elliott has maintained an extensive touring schedule, and also exclusively released his newest record, Gather ‘Round, for the Japanese market. He has been touring Japan promoting the release. On top of his blooming music career, Yamin supports and works as the spokesman for the Juvenile Diabetes Research Foundation, as he is himself a type 1 diabetic.